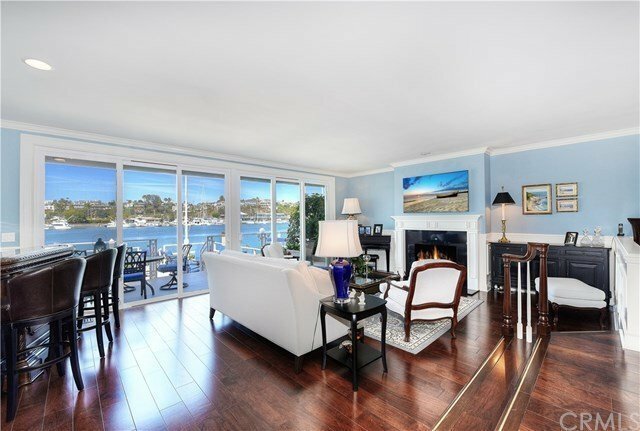 Presenting a beautiful and impeccably remodeled Lido Isle Bayfront residence with unobstructed sweeping views of Newport Harbor and Newport Coast. Completely remodeled in 2015 with luxurious finishes, this 3,100 SF Cape Cod style home with private dock has a special charm and warmth all its own. Featuring 4 bedrooms each with their own ensuite bathroom and 2 bathrooms down, this custom home offers high ceilings, a grand staircase, elevator, crown molding, wood flooring, formal dining area, 2 car garage, central air, second-floor laundry and a well thought out floor plan. Oversized bayside patio perfect for entertaining. Gourmet kitchen opens to family room and dining area. A spacious master suite with magnificent views, fireplace, and large walk-in closet. Master bath includes dual sinks, vanity and a large shower. Dock will accommodate a large vessel plus tender. Enjoy the beauty of bayfront living with wide open channel views, including watching evening sail boat races up and down the Lido channel. Lido Isle amenities include private beaches, docks, three tennis courts, parks & clubhouse, walking distance to local beaches, and the recently renovated Lido Marina Village featuring Nobu restaurant, shopping and the new Lido House Hotel.